Why just look at fountains when now you can afford art! Every water sculpture that was once created and is featured below can also be re-created for you in any size of height, width, and depth to fit your need in any special area. All the concepts that have been produced can also be mixed and matched with each other. For example, the floral themes may be added to the contemporary or more modern ideas. E-mail us today for any special request of robert by clicking on the various e-mail links throughout the pages and let's see what he can do for you. A closer look at the finer detail can also be seen at the following link (DETAIL) These sculptures shown here are guaranteed to surpass any other copper water fountains at the more than 1.3 million web sites searched under the keywords "water fountains". 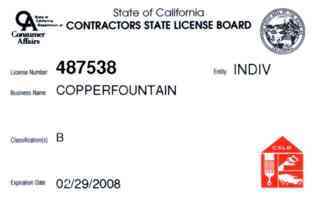 Copperfountain.com is second to none in quality, concept, and price combined, guaranteed. Due to web site traffic allowances, all pictures are reduced in size to 8-bit graphics. Feel free to request a larger picture at a better resolution in your E-mail. Every sculpture will arrive ready to fill with water and plug in. All included water pumps use a regular 110 volt outlet plug. The outdoor sculptures can be shipped with an accelerated verdigris coloration (greenish patina) such as the color seen on the Statue of Liberty. All indoor sculptures can be sealed in polyurethane plastic to preserve the vivid and brilliant colors that you see in the pictures. How and where you would send a payment! Click Here! A soft and beautiful 1/2 scale reproduction of the lotus flower with water flowing from leaf to leaf. An arrangement of lotus flowers, bamboo, and Chinese dogwood. A gentle cascade to the bottom with a larger pan diameter dominating the presence of the fountain. One of the most popular of the "dogwood" concepts because of it's grace and lines. Green slopes lead to the towering spires of Oz. The enchantment swirls as the shimmering water descends down the high rising city. One of many concepts using copper panels to display the water as it is completely dispersed over the sheeted surface. Many Kanji symbols are available to choose from for your own special message. 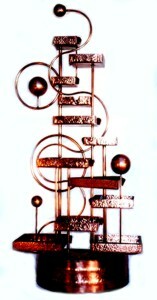 Triangular copper pans mixed with an assortment of spheres produces a clean and contemporary combination. Another concept of geometric form with hints of symmetry throughout it stature. Another copper panel concept with the subject of Asian healing once again drafting the theme except with scroll type panels suspended from a dormant tree with far east shaping. Among the lily pads and bright flowers, cat tails stand sentry over the delicate arrangement. As winter arrives the coat unfolds and now the branches are bare. Still the sound of cascade replaces the song of the wind in the leaves. A single wall panel concept with simple deflectors that disturb the smooth path of the water which completely covers the entire sheeted area. Another example of the "lotus" showing a smaller basin and the polyurethane coating used on indoor sculptures. Wading off shore, shortened heights of bamboo divide the lily pads and her blooms. Geometric combinations with unspecified lines align with the sense of the abstract. Winding stems support the shadows for the butterflies to drink while out of harms way. The pools elevated provide for the thirst of a few. The Giant Cascading Pans are embellished with rings set in level and the size of the pans. Each year so many concepts are embellished with additions that they create a whole new avenue for direction of previous works. A slender combination of cattails, lotus leaves, and dogwood flowers grace this simple representation of simplicity in form. A solo stand of river bamboo steps it's distance with the depths of water contained in elegant African lily pads. Winding grape vines echo the descent of the hammered bowls. Accents of foliage accent the various elevations. 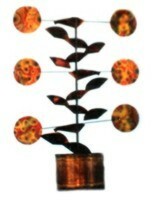 A wisp of dogwood swirls around the candle as water gentle in it's drape, covers the surface as it flows from the top. When demonstrated in heights over six feet, both water and copper are the subject in plurality. The larger concept of standing pipes which flow from the top known as "Emerald City", is also available in different heights including table tops. A beautiful flowered concept created in varied heights of trees and indoor arrangements. Everybody request a closer view of the "dogwood" as the above picture visits a past creation of 8 feet in height. As the above picture visits a close-up, this picture adds the delicate Asian approach. An assortment of cascading pleated bowls surround the gentle wrap of English ivy. An echo of smaller troughs follow to the side. Extensions of lotus leaf and flower stems create an elegant spectacle when heights drift over 36" and 48" from the basin. With water cascading through a dominant assortment of pans, the attention is water first, branching second in another display of height and elegance combined. A gentle cascade to the bottom with deep side pleated pans. Object oriented fountains in smaller dimensions. All fountains are available for outdoors with an accelerated verdigris finish which will eliminate years of waiting for natural colorations. An exterior development which can be incorporated onto any wall or flat surface. Floral attachments highlight the outer reaches of the vision. Valance and tray encompass the water draped slate as the encased light illuminates the sunset behind the "Copper mountain". A wall mounted shield backdrops the simulated planting of Aloe Vera. The last remnants of Sutter's mill still remain in this copper reminiscent. 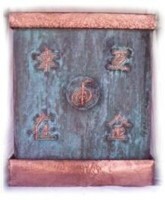 A copper double paneled concept with the subject of Asian healing drafting the theme. Wall shown is 7 feet tall. Wall or panel concepts can be applied in any location, in any size. A kinetic arm with discs swings in the center of the pyramid. Table top or wall mount. Concentric circles outline the kinetic movement of the arm and discs. Table top or wall. This large early American wall mount is a creation of kinetic movement, floral attachments, and handcrafted grace. A quick look at a fountain created almost three decades ago in my youth and apprentice to mastership.